Is there another Sun, Inner World and lost civilization inside of Earth? Is there a slight possibility that there is an inner Sun, Inner World and lost civilization inside of Earth? In recent decades, a number of findings have been made that drastically alter the views of the Inner Earth theory. According to many claims in the past decades, there is a world inside of our planet filled with supernatural beings, incredible technologies, and unexplained phenomenon. The ‘mythical’ land inside of our planet, its supernatural civilizations, and secrecy behind the entire subject stretches back over half a century. While the basis backing up such claims are nearly nonexistent, the legends must have originated from somewhere. What if Jules Verne’s classic “A Journey to the Center of the Earth” is true? And somewhere down there, an entirely new world is waiting to be explored, a place where somehow, living beings inhabit the depths of our planet, a place that ancient cultures and civilizations knew existed, or still exists today. What if it’s actually true? Plato even spoke of the mythical inner world. He mentioned that extremely long and narrow tunnels connect the four corner of our planet. When these are finally connected, Agartha would stand with a magical ruler holding the throne. But many similar accounts are present in history. If we go back to the year 50AD, we will discover that a Roman author by the name of Pliny the Elder stated that the ancient Atlantean civilization fled to the Himalayas after catastrophic events swiped over their capital city. Eventually, the Atlantean’s dug into our planet where they currently live, far away from ‘modern’ civilization. However, if we look towards the 20th and 21st century, we will discover a number of authors who have made shocking claims in regards to the Hollow Earth theory. 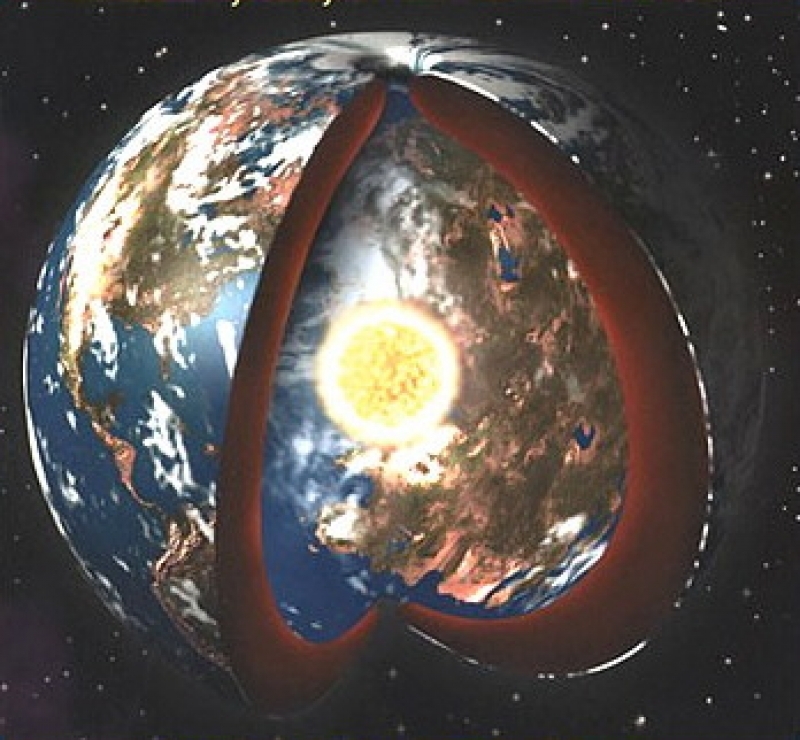 After proposing a new theory of the birth of our planet, Russian Physicist Fedor Nevolin became famous for suggesting that the Earth is hollow and most likely has a smaller Sun in the center. The Sun’s energy is said to penetrate through the holes in the Poles and accumulates in the center, making it possible for life to flourish inside our planet. But perhaps the most famous accounts ‘offering’ conclusive evidence that there is a world inside our planet come from the famous Byrd expeditions. Books like Worlds beyond the Poles by Amadeo Giannini claimed that Byrd had not flown over the Pole but inwardly through large holes leading into the Earth. Ray Palmer, mainly based on the book by Giannini, introduced his theory in the December 1959 issue of its magazine and obtained very positive results from the audience because of his theories and ideas regarding the Hollow Earth theory. It is noteworthy to mention that according to Giannini and Palmer, during Vice Admiral Byrd’s alleged flight over the North Pole in 1947, Admiral Byrd radioed that he saw beneath him, not snow, but areas of land with mountains, forests, vegetation, lakes and rivers and in the undergrowth, a strange animal that looked like a mammoth. It is said (citation needed) that in January of 1956, after leading an expedition to Antarctica, Admiral Byrd had stated that his expedition had explored 3,700 km beyond the South Pole and also just before his death, Byrd had said there existed a land beyond the Pole that was “an enchanted continent in the sky, a permanent mystery of Earth.” That land, according to other theories, was the legendary Rainbow City, home to a fabulous lost civilization. But much before Byrd and others spoke of a world inside our planet, ancient civilizations had oral, and written legends that suggest such ’emptiness’ inside of our planet might actually exist. The Macuxi Indians are indigenous people who live in the Amazon, in countries such as Brazil, Guyana, and Venezuela. According to their legends, they are the descendants of the Sun’s children, the creator of Fire and disease and the protectors of the “inner Earth.” Their oral legends speak of an entrance into Earth. Until the year 1907, the Macuxies would enter some sort of cavern, and travel from 13 to 15 days until they reached the interior. It is there, “at the other side of the world, in the inner Earth” is where the Giants live, creatures that have around 3-4 meters in height. However, there are more ‘stories’ that speak of similar events. The Babylonian hero Gilgamesh visited his ancestor Utnapishtim in the bowels of the earth; in Greek mythology, Orpheus tries to rescue Eurydice from the underground hell; it was said that the Pharaohs of Egypt communicated with the underworld, which could be accessed via secret tunnels hidden in the pyramids; and Buddhists believed (and still believe) that millions of people live in Agharta, an underground paradise ruled by the king of the world. Where did all of these legends originate from? Interestingly, in ‘modern’ times, several interesting authors have made similar claims. For example. Leonard Euler, a mathematical genius of the eighteenth century, concluded that the Earth was hollow, containing a central sun and was inhabited. Dr. Edmund Halley, discoverer of Comet Halley and Royal Astronomer of England also believed that the Earth was hollow on the inside with three “Floors”. In an extremely interesting interview with Coast To Coast AM, author and researchers David Wilcock stated that an alliance of ancient civilizations is living inside the planet. These ancient civilizations have been calling the inner Earth their home for long periods of time, and they are about the reveal themselves to the world. Wilcock states that based on his research, it seems as if these cavities are utilized so that advanced civilizations have a place they can live while looking out for everything that happens on the ‘outer Earth,’ the surface of the planet. Recent studies have discovered interesting details about what’s located inside of our planet. According to scientists, there is a large ocean of water located inside the mantle of our planet. They point out that this gigantic tank of water could fill the oceans on our planet up to three times. Researchers also indicate that the water located on the surface of our planet came not from space, but from within the planet itself, as part of “complete water cycle on the planet”. In addition to the water found inside of our planet, researchers have discovered an ‘unknown’ oxygen source deep below the surface of our planet. This discovery seems to point towards the existence of a hitherto unknown oxygen source believed to be located somewhere in the lower mantle of our planet. The mysterious source of oxygen is believed to be so enormous, that it can influence the climate on our planet. The team of researchers led by Dr. Elena Bykova from the University of Bayreuth reported the results in the scientific journal Nature Communications. Are legends just legends? Myths only fictional accounts? Or is there something to the countless claims that have been formulated throughout the years which suggest there is a gigantic world waiting to be explored beneath the surface of our planet.